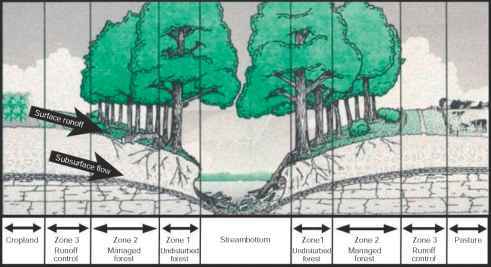 Impoundments reflect the natural characteristics of their catchments as well as the impacts of human activities. The natural influences on impoundments are, first, geographi cal: the effects of latitude, elevation, and their interactions with local geology, geomorphology, and climate. In turn, these features influence the hydrological and hydrochemi cal properties of the rivers on which the impoundments are constructed or that contribute to the impounded water. There are considerable latitude specific differences in the management of impoundments, particularly between tem perate and tropical regions. Characteristics of the inflowing waters may be similar for lakes and impoundments, but the transition from rapid flow ing to standing water calls for special consideration. From its source to its point of entry into standing water, a turbulent, flowing river possesses a high capacity for the oxidation of organic inputs: pollutant loads tend to be moderated during transport by a process ofriver self purification through atmo spheric exchange and reoxygenation. Organic pollutants contributed at margins of an impoundment encounter lim ited self purification capacity; particulate matter tends to sediment without resuspension in the quiescent water of impoundments and challenges a finite and weakly renewable oxidative potential. Therefore, it is desirable that impound ment shores be protected from pollution by buffer strips of meadow, scrub, or woodland. Intact beds of littoral, semiaquatic, and aquatic vegetation fulfill a similar function provided the water level fluctuations are modest or infre quent. Wetlands at the point of stream entry also provide important potential sinks for organic and inorganic nutrient loads. Another respect in which impoundments may differ is in the impact of increasing human populations and devel oping industrialization within their catchments. This leads to deterioration in the quality of inflow and the introduction of new pollutants; meanwhile, deforestation, intensive agriculture, and increased rates of soil erosion contribute to sediment loads.